Summer’s Complaint will be FREE from April 25th (National DNA Day) through April 29th 2018. Familial Adenomatous Polyposis, or FAP, accounts for roughly 1 percent of hereditary colorectal cancer and carries an extremely high lifetime risk of colon cancer and elevated risks for other exceedingly rare cancers. It is an autosomal dominant condition caused by germline mutations in the adenomatous polyposis coli (APC) gene. By the age of fifty, nearly 99 percent of untreated FAP patients will have developed cancer. This is the dark shadow that has lingered over one family since at least 1911, when a matriarch was first seen at the Mayo Clinic in Rochester, Minnesota for symptoms that would become commonplace in her descendants. Three of her five children died in their thirties with what they’d come to call “summer’s complaint.” Her granddaughter, genetically programmed by a defect on her 5th chromosome also developed cancer, which would ultimately take her life. This is that family’s sometimes tragic story. 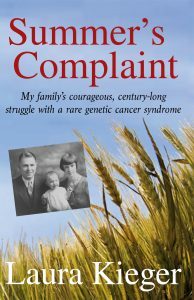 As told by a daughter, aunt, and sister who has been surrounded by its relentless destruction her entire life, Summer’s Complaint is at once a testament to the courage of those one family has lost and a journey toward understanding hereditary predispositions to disease and how best to combat them.